“The loud minority made a lot of noise. Everybody acknowledges, with rare exception, that what we did with our immediate deliverables was terrific,” Reid said. House Speaker Nancy Pelosi, D-Calif., famously said that about President Obama’s health care reform package. She was right. We are just finding out what was contained within that Obamacare law that Obama signed weeks ago. One: No sooner had Obamacare passed than the White House discovered that someone goofed. Despite all of Obama’s promises and talking points, Obamacare as passed by Congress does not require insurers to cover children with expensive pre-existing medical conditions. Immediately, the White House got an assurance from the insurers. After demonizing them for months as callous profiteers on others’ misery (in fact, the entire industry is barely profitable), Obama now tells Americans that they can trust health insurance companies to do the right thing out of the goodness of their hearts. Two: State governments discovered that they are no longer just required to guarantee payment for indigent patients’ care under Medicaid. Obamacare changes Medicaid law so that now states must also guarantee treatment to the poor. Some cash-strapped states expect this new definition to spawn court challenges, which will ultimately force them to pay exorbitantly high prices to doctors and hospitals for their existing patients. Three: Even as Medicaid’s costs increase because of the above, so will the number of Medicaid patients under Obamacare’s coverage provisions. Thanks to the “Cornhusker Kickback” — the special Nebraska provision that was extended to every state in the final version of the bill — the federal taxpayer is on the hook for 90 percent of the new patients’ expenses. So remember those rosy budget projections about Obamacare reducing the deficit, or at least not costing too much? Forget it. Four: Douglas Shulman, commissioner for the Internal Revenue Service, announced this week at the National Press Club that Obamacare means he can take your tax refund from you. Obamacare requires Americans to purchase insurance, but contains no serious enforcement mechanisms. So, Shulman said, the IRS will collect penalties from those who fail to purchase “qualified” insurance by confiscating the interest-free loans that taxpayers make to the government throughout the year through employment withholding. Five: The ski-tourism industry suddenly realizes that it is endangered by Obamacare. Ski resorts must now provide health care or else pay a fine for each employee who works more than 120 days out of the year — and many of their employees do. The bill had applied only at the 150-day threshold, until House Democrats changed it in reconciliation. They also cranked up the fine from $750 to $2,000 per employee, in order to pad their budget numbers. Those are just five things we’ve learned, out of more than 2,000 pages. You can bet we’ll learn a lot more in the seven months leading up to Election Day. Speaking of which, on Monday evening, Senate Majority Leader Harry Reid, D-Nev., explained away public opposition to this new health care law, shaped in large part by the special deals he made with reluctant senators last December. Reid’s state defies the laws of math. Sixty-two percent of Nevadans somehow constitute a “rare exception.” And it looks as though the “loud minority” will send Reid looking for a new insurance plan later this year. David Freddoso is the Washington Examiner’s online opinion editor. He can be reached at dfreddoso@dcexaminer.com. Branded as Oreos, traitors and Uncle Toms by the overseers and drivers who do the bidding of their statist masters, black conservatives are really under fire for belonging to the tea party movement and for opposing the progressive policies of Brother O. “I’ve gotten the statement, ‘How can you not support the brother?’ I know of people who would play the (liberal) role publicly, but have their private opinions. They don’t agree with the policy but they have to work, live and exist in the community … Why can’t we speak openly and honestly if we disagree?”—David Webb, conservative radio personality and organizer of New York City’s Tea Party 365, Inc. movement. “I’ve been told I hate myself. I’ve been called an Uncle Tom. I’ve been told I’m a spook at the door. Black Republicans find themselves always having to prove who they are. Because the assumption is the Republican Party is for whites and the Democratic Party is for blacks”—Timothy F. Johnson, chairman of the Frederick Douglass Foundation. “What am I supposed to do, vote Democratic just to be popular? Just to fit in?”—Clifton Bazar, freelance photographer and conservative blogger. A 38-year-old U.S. Marine Corps reservist and tea party supporter Charles Lollar of Maryland’s 5th District is among the 37 black Republicans running for U.S. House and Senate seats in November. Lollar is vying to unseat progressive Democrat Steny Hoyer, House Majority Leader. Recently, Lollar and his wife entered a bar in southern Maryland that displayed a Confederate flag. Once inside, they were honored with a pig roast, a motorcycle rally, and $5,000 in campaign contributions. They’ve been called Oreos, traitors and Uncle Toms, and are used to having to defend their values. Now black conservatives are really taking heat for their involvement in the mostly white tea party movement—and for having the audacity to oppose the policies of the nation’s first black president. “You have to be honest and true to yourself. Opponents have branded the tea party as a group of racists hiding behind economic concerns—and reports that some tea partyers were lobbing racist slurs at black congressmen during last month’s heated health care vote give them ammunition. But these black conservatives don’t consider racism representative of the movement as a whole—or race a reason to support it. Some black conservatives credit President Barack Obama’s election—and their distaste for his policies—with inspiring them and motivating dozens of black Republicans to plan political runs in November. “I’m so proud to be a part of this movement! I want to tell you that a lot of people underestimate you guys,” the former national political commentator for Fox News told the cheering crowd at a tea party rally in Nashville, Tenn., in February. Tea party voters represent a new model for these black conservatives—away from the black, liberal Democratic base located primarily in cities, and toward a black and white conservative base that extends into the suburbs. Among the 37 black Republicans running for U.S. House and Senate seats in November is Charles Lollar of Maryland’s 5th District. Once inside, they were treated to a pig roast, a motorcycle rally—and presented with $5,000 in contributions for his campaign. McGlowan, one of three GOP candidates in north Mississippi’s 1st District primary, seeks a seat held since 2008 by Democrat Travis Childers. The National Republican Congressional Committee has supported Alan Nunnelee, chairman of the state Senate Appropriations Committee, who is also pursuing tea party voters. Black members of the movement say it is not inherently racist, and some question the reported slurs. “You would think—something that offensive—you would think someone got video of it,” Bazar, the conservative blogger, said. “Just because you have one nut case, it doesn’t automatically equate that you’ve got an organization that espouses (racism) as a sane belief,” Johnson said. Where do we get the free Obama care? How are they really going to roll out the changes? Who ultimately will be the arbiter and decision-maker? What do I have to do right now? Why does it take so long for certain health care things to take effect? “We tell them it’s not free, that there are going to be things in place that help people who are low-income, but that ultimately most of that is not going to be taking place until 2014.”—Carrie McLean, agent for eHealthInsurance.com. Bottom line: until the administration issues more regulations, many details can’t be pinned down. Ann Wooten of Austin, Texas, a breast cancer survivor, said she didn’t understand whether the health insurance overhaul law meant that she should try to access private coverage again someday. She was diagnosed with breast cancer in 2008 after she lost her insurance in a divorce, and soon after she lost her job at a convenience store as a result of the economic crisis. Medicaid has covered her treatments but she must apply regularly to renew the coverage. She went back to school to learn hotel management and is seeking a good-paying job with benefits. She doesn’t know how the health overhaul will affect her options, and hasn’t yet found the time or energy to investigate. Americans who already have good coverage aren’t so worried about the immediate implications, but some admit that they’re plenty confused. “Why does it take so long for certain health care things to take effect?” said Sandra Preston, a state employee in Paterson, N.J.
Ben Wiesen, a software engineer who works for a small company in Tarrytown, N.Y., said he’d read up on the overhaul but remained concerned about the unknowns. “Members are still trying to wrap their head around everything that’s in this law,” said Michelle Dimarob, the manager of legislative affairs for the National Federation of Independent Business, the small-business lobby. Dimarob said the lobby’s primary concern was that its costs would rise over the next four years as a result of fees, taxes and coverage mandates related to the overhaul. The American Community Survey wasn’t around when Ronald Reagan declared that the nine most terrifying words in the English language are: “I’m from the government and I’m here to help.” If it was, he’d probably agree that having a government representative knock on your door, try to threaten their way into your home, and demand that you give them very personal information is far more terrifying. What’s especially problematic about the ACS are the answers it demands from citizens. The least threatening of them are just strange — such as asking whether your home has a flush toilet and whether “there is a business (such as a store or barber shop) or a medical practice” on your property. Then there are the financial questions. The ACS asks everything from your sources of income (in dollar amounts) to how much you spend on gas, electricity, and water. The IRS just asks what you earn; the Commerce Department wants to know how you spend your money as well. Even more invasive are the personal questions. The questionnaire asks how many people live with you and their relationship to you, along with their names, ages, gender, and race. Most creepy of all are the questions about your daily routine. The ACS wants to know where you work, what time you leave for work, how you get to work, how long it takes you to get to work, and how many people travel with you. Downright Orwellian. That was my first thought when I received the form. And initially I didn’t quite believe that the government would demand such personal information and threaten citizens with fines (up to $5,000) if they don’t hand it over. When friends, from Justice Department officials to university lecturers, heard about it from me, their first thought was that it was some kind of sophisticated mail fraud. After learning that the ACS was real, I reluctantly spent an hour answering the questions — vowing at the same time to protest to my representatives in Congress — and dropped the form in the mail toward the end of January. A few weeks after sending in the form, a representative of the ACS left a note at my apartment asking me to contact her. When I did, she said she’d like to come to my apartment to go through the questions. I replied that I’d already filled out the form, and if they’d lost it, it was their duty to find it. I also didn’t want a stranger entering my home and asking personal questions (and ones that I’d already answered), I told her. The ACS representative ignored my comments and later turned up twice unannounced at my apartment, demanding entry, and warning me of the fines I would face if I didn’t cooperate. I cited the Fourth Amendment (“The right of the people to be secure in their persons, houses, papers, and effects, against unreasonable searches…”), and reiterated what I told her on the phone. After that, on March 14, I sent a letter of complaint to her regional director. My saga ended on March 23 when an ACS program supervisor investigated my case and discovered my form had in fact been received on February 8, only it was sitting on the side and never processed. She thanked me for writing in to complain — she said it was my letter that prompted the search for my form — and said she would investigate the harassment I received. My experience exposes that a basic problem with the government having the kind of detailed information the ACS asks is not only from some rogue bureaucrat abusing it, but from an incompetent one losing or misplacing it. U.S. Census Bureau workers have even in the past accidentally published people’s personal information on public websites. But the bigger problem with the ACS is the underlying government mentality it exposes. From the Commerce Department thinking it can demand any personal information it wants, to a government representative thinking she can threaten her way into a private home to get those answers — what today’s government and its workers have forgotten is that government is accountable to the people, not the reverse. It is “government of the people, by the people, for the people,” in Abraham Lincoln’s immortal words. But in today’s America, the servants are increasingly acting like the masters. Daniel Freedman is director of strategy and policy analysis at the Soufan Group. 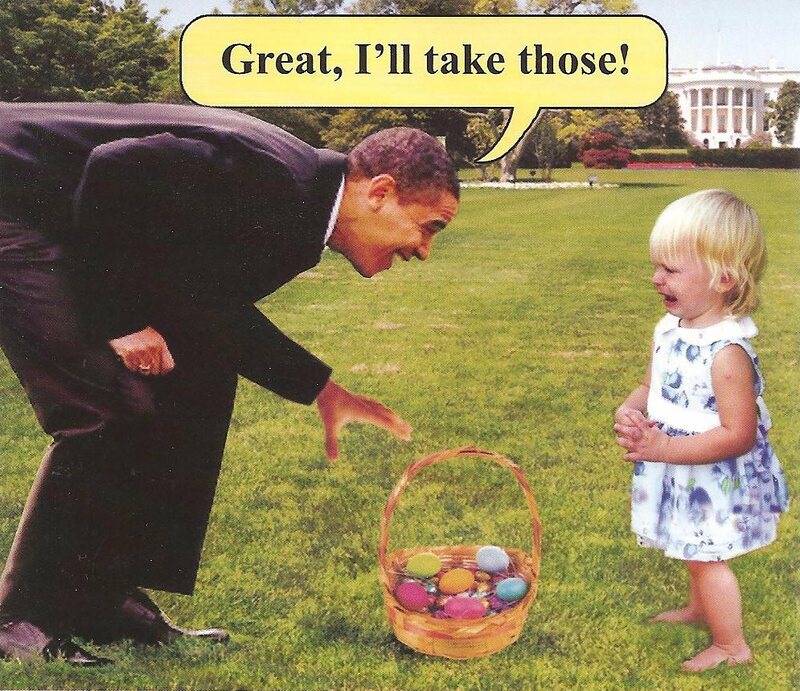 During the annual White House Easter Egg Roll April 4, 2010, Brother O takes a few moments to explain his new Redistribution Plan to the young lady. “It’s not that I want to punish your success; I just want to make sure that everybody … got a chance to success, too. I think when you spread the wealth around, it’s good for everybody,” Obama said.